Each education curriculum has its learning outcomes that are important to evaluate it. A learning outcome is the particular knowledge, skill or behavior that a student is expected to exhibit after a period of study. Learning outcomes are statements that specify what learners will know or be able to do as a result of a learning activity. Outcomes are usually expressed as knowledge or skills. Other times, they represent the lesson objectives. Learning outcomes should flow from a needs assessment. The needs assessment should determine the gap between an existing condition and a desired condition. Learning outcomes are statements which describe a desired condition – that is, the knowledge, skills, or attitudes needed to fulfill the need. They represent the solution to the identified need or issue. Objectives are the desired and wanted standard of learning. Outcomes are the achieved objectives that have come true. Cognitive (cognition; what you know, factually speaking, and can discuss matter-of-factly; professional knowledge such as human anatomy; the stuff of textbooks). Psychomotor (what your body can do with what your mind knows, such as drawing blood, moving a patient, etc. ; the stuff of professional skill; things rarely learned without demonstration, coaching and practice). Affective (affect; the emotions or feelings of being a professional -- such as desire to keep learning, compassion for the sick, respect for fellow workers and employers). 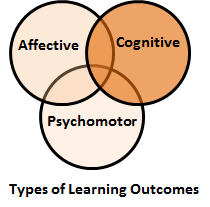 Measuring learning outcomes provides information on what particular knowledge (cognitive), skill or behavior (affective) students have gained after instruction is completed. They are typically measured by administering assessments at sub-national, national, regional and international levels. Countries decide what the purpose of the assessment is, what population will be assessed, what is to be assessed, how it is to be assessed, and how the measures are to be reported and utilized. Policy makers might decide to focus on a limited amount of domains and grade levels while others will focus on the measurement of student knowledge in a wide range of domains and grade levels. Assessment must be : ( s m a r t ) . I mean that it must be: subjective / Specific, measurable, actual / agreed upon, reliable /realistic / relevant / reasonable and timed / time related. Education systems across the world are based on the principle that education quality is defined by its contribution to the development of cognitive skills and behavioral traits, attitudes and values that are judged necessary for good citizenship and effective life in the community. Over the last 10 years growth research has been able to demonstrate that the quality of education, has a statistically significant and important positive economic effect and that ignoring the quality of education limits economic growth. Researchers can now document that the quality of human resources, as measured by assessment scores, is closely related to individual earnings, productivity and economic growth. This evidence shifts policy makers’ attention increasingly from inputs to outcomes, i.e. what learners should ultimately have learned at the end of a significant educational experience. While it is important to know how much money is being spent on such issues as teacher education and physical facilities, policy makers recognize that it is equally important to know what children are learning in the classroom: What kind of knowledge, skills and attitudes does the education system develop? How do assessed learning outcomes reflect the stated goals and objectives of national education systems? What factors are associated with student achievement? Do particular sub-groups in the population perform poorly? How well are students being prepared to succeed in an increasingly knowledge-based economy? Ultimately, information on learning outcomes assists countries in making informed decisions about interventions to improve educational quality and help policy makers monitor trends in the nature and quality of student learning over time. National, regional and international assessments allow for the bench marking of student performance against corresponding standards. In the context of international development assistance, focus on learning outcomes increases stakeholder attention on deliverable and results, and may increase accountability based on performance. (1) The specified action by the learners must be observable. (2) The specified action by the learners must be measurable. (3) The specified action must be done by the learners. The ultimate test when writing a learning outcome is whether or not the action taken by the participants can be assessed. If not, the outcome probably does not meet all three of the characteristics. (3) some result that must come from their action. How do you fix an unclear outcome? Participants will understand the nine reasons for conducting a needs assessment. Participants will develop an appreciation of cultural diversity in the workplace. If you ask a simple question (“Can it be measured?”), you see readily that these learning outcomes have shortcomings. They are not measurable. The same outcomes can be modified by changing the action verbs. Participants will list nine reasons for conducting a needs assessment. Participants will summarize in writing their feelings about cultural diversity in the workplace. Learners have a better idea of what is expected of them. Since the learner’s performance should be observable and measurable, the verb chosen for each outcome statement should be an action verb which results in overt behavior that can be observed and measured. They are subject to different interpretations in terms of what action they are specifying. Such verbs call for covert behavior which cannot be observed or measured.